When we blend turmeric, pepper and ginger together for example we have something that warms, moves the blood, clears the channels, moves out inflammation and pain. However, this is also a combo that’s very HOT and DRY. It’s a somewhat reducing, yang, langhana, catabolic combo. No problem there, except that most of us also need plenty of building, yin, bruhana/bṛmana, anabolic support. If you’ve been following what I do lately, you’ve probably seen my new line of medicinal food products. My signature product, Rose Gold Rejuvenation, is a golden milk formula that balances the best of golden milk’s classic blood moving, ant-inflammatory actions with rejuvenative, building, balancing herbals for a truly unique, effective, and absolutely delish drink mix. In Rose Gold Rejuvenation, I blend crushed dates, Anantamula, Brahmi, Rose & Vanilla with Turmeric, Ginger, Black pepper, Ashvagandha and more. The result is a daily potion that reduces inflammation and pain, beautifies the skin, builds energy, relaxes the nerves, supports sound sleep & hormonal balance and builds ojas aaaaand tastes delish! I’m not making any product claims here, just letting you know what some of these plants do separately, and together! So, certainly you can head over here and get yourself some Rose Gold Rejuvenation, but in this post I’m going to teach you how to make a slightly simpler version at home (just so that you don’t have go to 5 different online shops to find ingredients, or spend megabucks). Mix all ingredients, except vanilla extract, in a clean glass jar with a lid. To make up a cup of Rose Gold, add approx 2 tsp to 1 cup of hot milk or veggie mylk. Whip up with a small wire whisk or immersion blender, so it’s completely blended with no lumps. Enjoy as is, or add to tea or coffee (my favorite tea to add to is a blend of 2 parts red roobios and 1 part organic Assam, pressed in a french press pot). Our family is obsessed with this batter, which we use most often for pancakes or as a base for savory toppings and pizza! This recipe is adapted from the traditional Indian Idli, which is made from fermented rice and mung dal. Fenugreek seeds are commonly added for flavor and to help with digestion. For this recipe you will need a high-powered blender. Play with the quantity of water you add to the fermented batter to yield the Idli you want! You can make the batter thin for crepes or thick for lathering with toppings like ghee or tahini with cinnamon and honey. We like to top ours with Coconut Fudge Sauce and roasted walnuts, or yogurt with maple syrup. Preheat your oven to the warm setting to keep the idli warm between batches. Combine the mung dal and rice in a glass jar or bowl and cover with double the volume of water. Soak for at least 8 hours (from morning to night or overnight). After soaking, rinse the mung dal and rice with cold water in a fine mesh strainer, rinsing until the water runs clear. Transfer the mung dal, rice, and ½ cup of water to a high-powered blender and whiz on low speed until the dal and rice are ground. The batter will be thick. Then, while using the tamper (the stick with which you can push down the blender contents), add ¼ cup of water at a time until you’ve added a total of ¾ cups. As the batter becomes easier to blend, increase the speed until the batter is smooth. It should feel grainy when rubbed between your fingers, like fine, wet sand. Then, transfer the idli batter to a wide, large bowl or wide, large glass jar or container. (I like to transfer it to a glass vessel so that I can see how much the batter has risen.) Cover the vessel with cheesecloth or a thin tea towel and seal it around the mouth with a rubber band. Allow the batter to ferment for at least 12 hours or up to 48 hours. After that, you can seal your vessel or jar and transfer it to the refrigerator to store for up to 3 days. To prepare your idli, stir in a tablespoon of water at a time until you have your desired thickness. Then, melt 3 tablespoons coconut oil or ghee in a large cast iron skillet. When the oil is very hot, add three heaping spoonfuls of batter, spreading it out with the back of the spoon to form a round pancake. Leave an inch between pancakes so you’ll have room to flip them. Cook for 3-5 min on the first side, until the edges look cooked and begin to brown, and the batter begins to bubble. Flip the pancakes and cook for about 1-2 minutes on the opposite side. Transfer the idli to an oven-safe plate or baking sheet and keep warm in the oven until ready to serve. Repeat with the remaining batter. These are best served warm (though you can always reheat leftovers on a pan, oven, or toaster oven). Serve with roasted nuts and Coconut Fudge Sauce for drizzling over top. Wrap leftovers in foil and store in the fridge for up to 3 days. This decadent chocolate sauce disguises a healthy elixir that you can drizzle over pancakes, breakfast porridge, add to a smoothie, or blend with warm nut milk for a rich and satisfying cocoa drink. Note: The coconut cream and milk should come from a full fat can of coconut milk. The coconut cream in the ingredient list refers to the thick white cream that has risen to the top. The coconut milk refers to the liquid part of the milk. Combine the ingredients in a small pot over medium heat and whisk until fully incorporated and warm. Add a teaspoon of water at a time until the mixture is a pourable consistency. Store leftovers in a sealed container in the refrigerator for up to 1 week. The sauce will harden. You can either scoop out some of the sauce to add to smoothies, or reheat the sauce before serving. With flu season on it's way and colds always a popular theme this time of year, I'm gifting you my favorite protocols and products for prevention and use during the flu and other seasonal health challenges, including my homemade elderberry syrup! I sent out something similar last year and I was so glad to hear it helped so many - here's the updated version. In addition to the guide below, I highly recommend having a local holistic practitioner who can help you get through seasonal health challenges in a way that supports your health rather than suppressing your symptoms. This could be an integrative doctor, practitioner of Chinese Medicine or Ayurveda, a Naturopath, an Herbalist or Homeopath... someone who's really and can follow you closely when needed. 1. Hand washing, of course. 3. Influenzinum homeopathic - a dose of 200C influenzinum once/month. 5. Deep immune supporting formulas: Wish Garden Daily Immune (they make one for adults & one for kids), Synergy Company Immune Health (contains Beta 1,3 Glucan extract, medicinal mushrooms and astragalus), Herbs Etc Deep Health. *Stop taking these if something acute comes on, these are only for prevention. 8. Pasteurized dairy is a known aggravater for some. If you take dairy look for raw, organic from a local dairy (flash boil it yourself if desired) and cook it with spices, drink it warm. Golden milk is a good way to take milk. Avoid hard cheeses and commercial yogurt - make your own or get it fresh from a local dairy. 9. Use your neti pot daily OR use nasya oil in dry climates. 10. Make sure your bowels are moving well. Take triphala nightly (this is an Ayurvedic formula that you can find in most health food stores and online). If you like, get a colonic once/month. When you feel something coming on - at this point there's something circulating but it hasn't yet manifested, so it can be difficult to know what you're dealing with. Everything on this list is for this time, before you know whether it's a cold or flu or ... whatever it becomes. Typical symptoms would be swollen glands, sore throat, beginning body aches or neck ache, feeling really run down, starting to cough or getting a runny nose. 2. Begin taking one of the following andrographis based formulas: Synergy Company Rapid Rescue, Herbs Etc Immune Alert, or another andrographis & echinacea formula for this same purpose. There are lots of good formulas out there for moving things out before they've taken root. Make sure andrographis is in the formula. I'd say more than half the time that I do one of these formulas at first onset, I'm able to clear the invader and not get sick. These formulas need to be taken often - hourly or at least every 3 hours or so, as directed. The Ayurvedic compound Mahasudarshan is great at this time too. 7. Avoid all sugar, refined flour and dairy products - eat light, clear, cooked foods. Hot and sour soup at this time is a favorite. 9. Take a hot sweat bath - see if you can sweat it out. I like Dr. Singha's Mustard Bath for this. 1. For cold, take Umckaloabo, aka Umcka (pelargonium sidoides). 3. Make big pots of fresh ginger root tea. You can add fresh lemon juice and raw honey (once your cup has cooled a bit). 4. I like Herbs Etc's Peak Defense formula during this time. It helps to keep mucus running clear and avoid infection. 5. Drink lots of hot broth, don't eat a lot besides but do go with your level of hunger. When I lived in Thailand, my friends used to make for me a big pot of khao tom (rice soup). This is basically a rice congee, where you cook a small amount of rice in a lot of water until the rice breaks down and add whole black peppercorns and lots of garlic and ginger. 6. Don't suppress your fever (and if you can't mount a fever, consider inducing one with a hot bath and sweat). 7. If you live in a dry climate, use humidifiers to keep your respiratory passages soothed and moving the mucus out. You can also steam a couple times/day in the bathroom or shower, or use a hot water pot on the stove and cover your head with a towel to achieve a steam. 8. If your bowels aren't moving daily, a warm water enema can work wonders. 9. Work with a homeopath or other holistic practitioner to manage your unique symptoms and keep infection at bay. 10. When the illness is gone but there are lingering challenges you may need to switch formulas to one that will clean things up. I like Phytocillin by Herbs Etc, but it really depends on what you're dealing with. *Important Note: none of these recommendations are a substitute for sound medical advice. If you have questions see the advice of a qualified medical practitioner. Your syrup will keep for several months in the fridge. You can make a smaller or larger batch just use the ratio of 1:3 dried elderberries to water and the same quantity of honey to finished berry decoction, and 1/2 that much apple cider vinegar. Extract of elderberry is great both as a preventative (it’s high in vitamin C, antioxidants & immune supporting minerals) and great when cold or flu comes on. Research shows that Elderberry inhibits several strains of influenza, including H1N1. Studies show that when elderberry extract is consumed once one has active flu virus, it can significantly shorten the duration and severity of symptoms. Dosage: I recommend taking 1 teaspoon 1-2x/day as a preventative for children over 5 and adults. For children 1-5 years I recommend half of this dose (I am comfortable giving babies raw honey at age 1, but do what you’re comfortable with!). When illness is coming on & has settled in, the dose can be doubled and taken 4+x/day. If you’ve known me for more than a minute, you know I’m a big tea drinker. You won’t usually see me drinking coffee, and I’ve never put out a recipe with coffee in it. But this one has been on heavy rotation in my morning household - helping me accomplish a lot at a busy time. This recipe has a built-in way to reduce or get off coffee altogether if that’s something you want to do! Dandy Blend is my favorite coffee replacement and a delish drink in its own right. You can find it in select health food stores or online. It has a roasty, toasty flavor and has a nice liver cleansing action. Cardamom blends well as a flavor with coffee and has the added benefit of reducing some negative effects from coffee. If you are trying to ease off coffee, use just a couple ounces to make this drink and use a bit more of the Dandy Blend and hot water. Ready to go caffeine free for a time? Remove the coffee from the recipe and use only Dandy Blend and hot water. Brew your favorite type of coffee in a french press, Chemex or other method of your choice. In a blender combine coffee, Dandy Blend powder, hot water, cardamom or Raw Cacao Energy, butter/ghee and MCT oil. If desired, and especially if pitta and/or vāta are high, add a little milk/coconut milk & coconut sugar or monk fruit sweetener or other sweetener if desired. This smoothie is protein and fat rich so it satisfies way beyond the timeframe of your average morning porridge. Yet, it’s warm and rich so like porridge, it’s perfect for cold or rainy days. The base of almonds and dates alone builds ojas (vital energy & immunity) which is amplified by the addition of Mamāyurveda Raw Cacao Energy mix, which contains medicinal mushrooms, ashvagandha, cacao, rhodiola and spices. 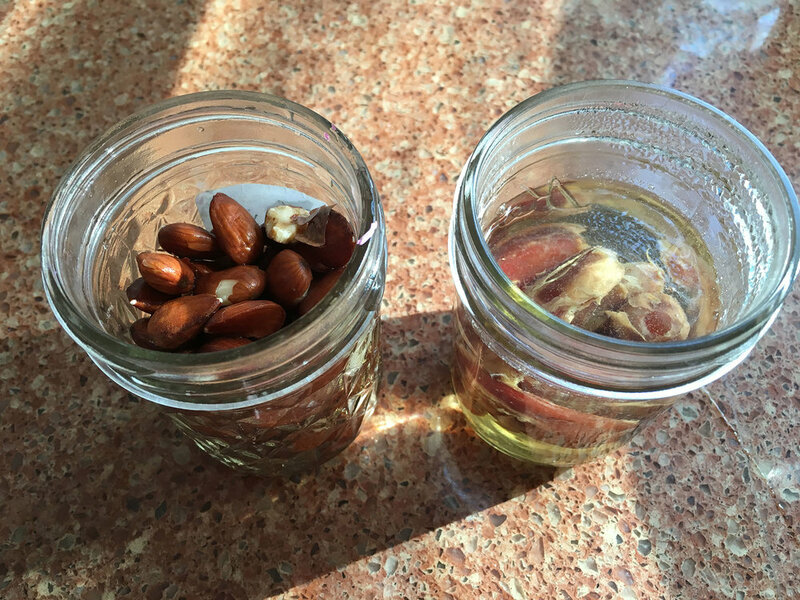 Put almonds and dates in separate containers, and soak overnight. 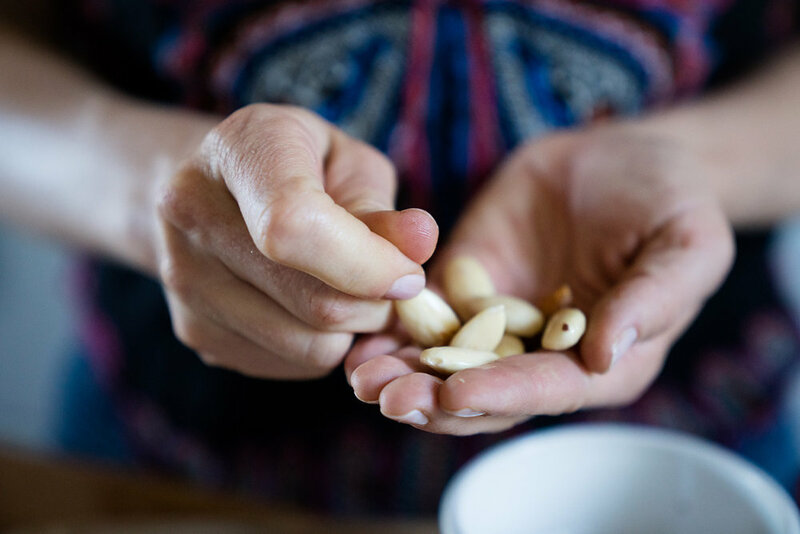 If you forget to soak overnight, pour boiling water over the separate containers of almonds (this is blanching and will allow you to remove the skins), and dates and allow to sit 10 min. Peel almonds and discard skins, pit dates. Our friend and client Emma Frisch has created this recipe with us in mind! :) My addition is that I recommend adding or subbing a little fresh mint if you're working to balance pitta. Enjoy! It’s no secret I’m a fanatic about pesto. (I’m part Italian, so I kind of have to be, right?) I have a Basil-Sunflower Seed Pesto recipe in my new cookbook and countless more variations – from radish top to garlic scape and mint – here on the blog. Pesto is a wondrous thing, for so many reasons. Children tend to love it, and you can disguise anything green inside (like kale, chard, and other nourishing greens and herbs). It can be used to dress pasta, spread on bread with cheese, season soups and tossed with roasted vegetables. And, it freezes beautifully, adding a mouthful of summer to any winter meal. I love pesto so much that I’ve probably had pesto pasta every other night for the past seven and a half months, while pregnant with baby number two. (Ok, maybe not thaaaat much, but almost.) This is because I’ve had a much harder time finding my creative juice in the kitchen, other than childhood comfort foods. Like pesto pasta. One saving grace is that I’ve been working with an amazing Ayurvedic counselor, Sunny Rose Healey of Mamayurveda, who has been guiding me through prenatal nutrition and health. Ayurveda is an ancient system of Eastern medicine largely rooted in food and daily practices, which resonates so much with a philosophy I abide by: we are what we eat. Sunny’s support has been immensely helpful, because I simply haven’t had the same pregnant-glory-feels as I did while pregnant with Ayla. I’m chasing a toddler and working nearly full-time, and my body was also depleted after nursing Ayla for two years, with a short break before discovering we were pregnant again! So, I’ve had to find alternative ways of keeping my energy and immune system boosted while growing Ayla’s little sibling. Sunny has been helping me find ways to create tri-doshic recipes, which are Ayurveda-friendly and geared for all three doshas. What is a dosha, you ask? A dosha is our body’s constitution. According to Ayurveda, we are all born with one of three doshas, or a combination of two: pitta, vata or kapha. Yet there are times in our life when our constitution changes, for example, when we’re pregnant. A tri-doshic recipe, however, will boost all three constitutions with healthy food combinations, like this pesto recipe which packs in radish greens, basil, healthy oils and fats, and nutritional yeast. You can always substitute the radish greens for any other greens like arugula, turnip tops, or kale, and treat them the same way in the recipe. It takes no time to whip up and will bring you a jarful of joy all season! If you’re heading outside, pack this in a leak-proof jar and bring along fixings for a grazing board, like cheese, crackers, pickles and trail mix. Ayla liked it so much she agreed to be my hand model for a good twenty shots before she started spooning the stuff straight into her mouth :). Radish greens are an unprized gem, often seen as the unusable trimmings from their rosy red, spicy roots. But in fact, they offer a wealth of vitamins and antioxidants, and can be cooked like spinach, kale, and other familiar cooking greens, or incorporated into sauces and spreads like this spritely pesto. Spring radishes are my favorite, as they’re among the first vegetables to surface and usually appear when garlic scapes are harvested as well. The combination of the two in this recipe creates a rich, luxurious pesto that everyone will love. Toss with brown rice pasta, drizzle over grilled or roasted vegetables, or spread on bread for a sandwich. In a small saucepan on the stovetop, add the radish greens with a splash of water and wilt gently over medium-high heat. Remove from heat and transfer to a blender or food processor. Add the remaining ingredients to the blender and pulse until the greens are broken down. Slowly bring the speed up to a high whiz until the pesto is smooth and creamy. Transfer to a jar and drizzle olive oil over top to create a film. This will act as a seal and help preserve the pesto’s bright green color. Store in the fridge for up to 5 days until ready to use. Each time you remove some pesto, create a new olive oil film to preserve. You can substitute radish greens for any other greens like arugula, turnip tops, or kale, and treat them the same way in the recipe. EMMA FRISCH is the cofounder and culinary director of a premier glamping destination in the U.S., Firelight Camps, featured in Vogue, Travel Channel, Wall Street Journal, and Martha Stewart. She was a top finalist on Food Network Star season 10, and lives in Ithaca, New York. Have you ever wondered which oils you should be using for your self massage and what to change to as the season shifts? If so, I've got you covered in this post, where I'll break down what I consider to be the best choices. While there is a wealth of beautiful and rich medicated oils out there, I'm focusing here on simple, easy to obtain choices that are made in the US. If you find a company you love and want to try some of the more exotic blends just make sure the oils and the herbs in them are truly organic or pesticide free. 1. It's important that your oil be organic. Pesticides tend to collect in fat and thus can be quite high in oils. The skin is very absorptive, for better or worse. It's for the better when there are herbs in your oils that you want to feel your body as medicine, but can be for the worse if you're putting anything on your skin containing chemicals or anything you wouldn't want to eat. I mainly use herbal massage oils from Banyan Botanicals in my practice because they are organic and high quality. I also love Sarada oils as they are rich and smell amazing. They claim their oils are chemical free and organic but I'm not sure whether they're certified as such. Any high quality organic oils you have access to are thumbs up. 2. Choose an oil based on your current constitution and state of imbalance (based on whether vāta, pitta or kapha are highest or a combination). Vāta - Sesame is the best choice vata because it's warming and because sesame is considered the king of massage oils for its ability to penetrate deeply and nourish the tissues. Almond Oil is another possibility if you don't like sesame as it is also warming. Vata massage oil (oil infused with special herbs) is especially good if vata is high. Banyan, Sarada USA both make good vata oils. Specialty oils for vata and vata transitions:For increasing strength and stamina postpartum, post illness or post surgery try Ashwagandha/Bala oil. This is also the oil I recommend for massaging new babies. Toddlers and older children begin to show signs of which doshas need balancing so you can choose for them the same way you would for yourself. Pitta - For plain oils, sunflower and coconut are the best choices, coconut is especially good in hot weather. Herbal/Medicated Pitta Massage Oil from Banyan or another reputable company is my top recommendation as pitta can really benefit from the cooling herbs added to the oils. Applying Bhringaraj Oil or Brahmi Oil to the scalp and soles of feet at bedtime supports healthy pitta and encourage sound sleep. Kapha - Sesame, corn and mustard oils are all helpful for kapha because they are warming, but herbal oils are an even better choice for Kapha, as they add more Kapha pacifying properties to the oil. Banyan’s Kapha Massage Oil is a great choice. Not sure which doshas are highest? If you're a hot type and have a medium body frame and tend to inflammation, acne, rashes, hyperacidity, loose stools, anger, or you're kinda Type A then go with the recommendations for Pitta. If you're a cold type and tend to have a thin body frame, cold hands and feet, insomnia, spaciness, anxiety, worry, constipation, or go any which way the wind blows then go with the recommendations for vāta. If you're a cooler type and have a solid or heavy body frame, you're curvy or tend to gain weight easily and have a calm, stable nature and you can be slow, stubborn and don't change easily then go with the recommendations for kapha. If you have a mix of a bunch of these things then go with Banyan Botanicals' Daily Massage Oil, which is balancing to all 3 doshas, or mix sesame and sunflower oils 1/2 and 1/2. You can find it here. 3. Also take into account the current season and climate. You may need to switch oils if you go on vacation somewhere hot during the winter. Or, if you have two doshas you're working with like pitta and vata for example, try using a cooling oil in hot weather and a warming oil in cool weather, or mix the 2 oils half and half and call it good! After you've considered these 3 points and narrowed down your choices, you can choose whether you want to save money and go with a plain oil like sesame, sunflower or coconut, or invest in an herbal oil. If it's in your budget, I recommend the herbal oil because you absorb medicine through your skin, so this is a way to bring balance in addition to working with diet, lifestyle and oral herbal medicines and supplements. You can, however, stretch that oil a bit by adding plain sesame or sunflower to it. For your head - Oils infused with Bhringaraj and Brahmi are cooling and grounding. Massage the oil in before bed and put on a cotton stocking cap, or massage and leave in for 2-30 minutes and then shampoo out. You may need to wash a couple of times to remove all of the oil. Tip: apply the shampoo dry first, wash then rinse and repeat. For your hair - Banyan Botanicals makes a luxurious hair oil that's soothing to mind and emotions and also makes your hair look gorgeous. Check it out here. For painful back and joints - Mahanarayan oil massaged into these areas and left overnight or 20-30 minutes before taking a hot bath or shower can make a big difference. To receive full benefit repeat daily, even twice daily. You can find mahanarayan here. In pregnancy, a very gentle form of abhyanga (applying the oil and leaving it to soak in rather than deeply massaging) can be practiced in the 2nd and 3rd trimesters. Choose a simple oil based on your current needs as outlined above. Schedule a consult with Sunny to learn more about your constitution and how to bring balance.